As you are aware, we have campaigned for much improved funding for our schools for a sustained period of time. In September 2017 the government announced its new National Funding Formula. Consequently, the Department for Education reduced the amount that it had originally planned to take from school budgets by £1.3 billion (2015-2020) and confirmed new formula arrangements for how schools would be funded from April 2018. Headteachers have looked in detail at the Department for Education’s own funding information and statistics and have concluded that the new arrangements fall well short of what was promised. The attached documentation shows how schools in West Sussex are being treated under the new formula. Despite promises to the contrary, your child’s education is still worth far less than that of many other counties. It is acknowledged that factors such as deprivation and English as a second language, mean that schools should be funded differently, but the disparities that will still be in place for the next financial year 2018-19 (and beyond) are impossible to regard as being satisfactory in any way. 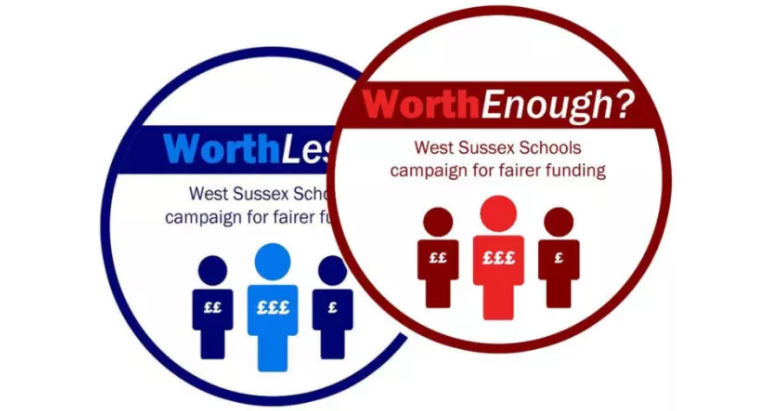 100,000 pupils in West Sussex will receive £30 million less than the same number of pupils in the average funded authority, £145 million less than the same number of pupils in Greenwich and £263 million less than those in Hackney. Over the five years, for example, of your child’s education from Years 7 to 11 – therefore, this equates to differences of £150 million from the average funded authority and a staggering £1.3 billion less than pupils in Hackney. In Crawley, a secondary school of 1189 pupils will have a budget of £5.5 million. This compares to a budget of £9.3 million for the same size school in Hackney. The total funding difference is £3.8 million (69%). In Worthing, a secondary school of 1176 students will have a budget of £5.4 million. This compares to a budget of £9.2 million for the same size school in Hackney. The total funding difference is £3.8 million (70%). 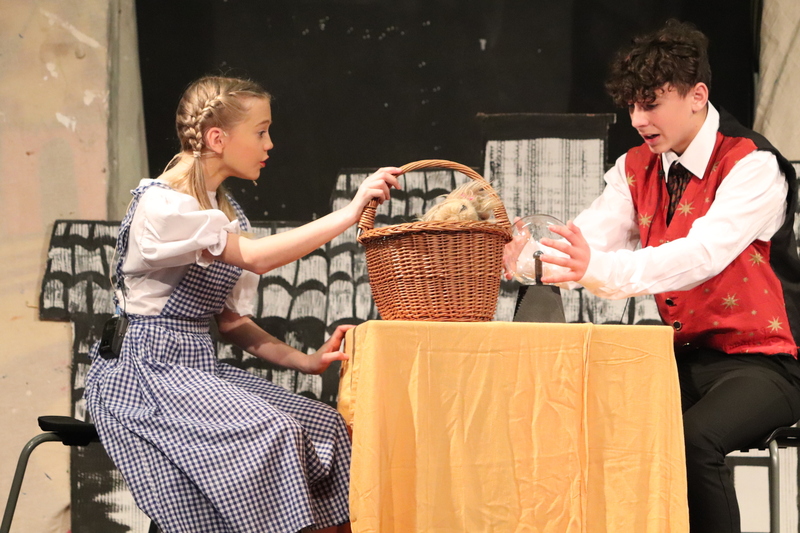 In Bognor, a secondary school of 1177 students will have a budget of £5.5 million. This compares to a budget of £9.2 million for the same size school in Hackney. The total funding difference is £3.7 million (68%). In Upper Beeding, a primary school of 340 pupils will have a budget of £1.2 million. This compares to a budget of £2 million for the same size school in Hackney. The total funding difference is £800,000 (67%). The attached fact sheet provides examples across a range of West Sussex secondary schools, which clearly demonstrates how your child’s education is being penalised by the proposed new formula. The same percentage differences are also apparent in our primary and special schools. Additional funding could also be spent on a range of other crucial resources and support staff in areas such as Special Educational Needs and Disability, counselling services and intervention work for students across the ability range. For over two years, Headteachers have run a relentlessly reasonable campaign requesting a fair deal for the children in our schools. We have absolutely no desire to see schools in other parts of the country suffer a reduction in their own funding, but we cannot accept that the children that we educate are treated so unfairly. At times, our resources and that of the Local Authority are so stretched that we worry about carrying out the most basic duty – that of maintaining the best possible welfare provision – to the levels to that all schools should be able to. Some schools are even resorting to asking for parental contributions to supplement their beleaguered budgets. This is entirely unacceptable. Headteachers in thousands of other low funded areas of England, are all stating the same facts. We are delighted that a cross party group of councillors from West Sussex are also continuing to support our campaign so clearly. On 4 January 2018, councillors of all political affiliations used the West Sussex County Times to state publically that the proposed new formula is “not fit for purpose”. In November, representative Headteachers from 5000 schools across 25 counties, petitioned the Chancellor directly. The response was both superficial and inadequate. We now need every parent to step up alongside their child’s school and insist that matters must improve. As a first action, we need our local MPs to raise their voices publically and unequivocally once again to confirm that the new funding formula proposed by the government is simply not fit for purpose. We have already received an initial statement from them (excluding Nick Gibb MP as he is the school’s minister) and have attached it for your information. The fact that we have a new Secretary of State merely adds to the sense of urgency. Our collective work – and in particular, the sustained intervention of local MPs – was important in ensuring that some improvements were made to original proposals for the new formula. We now need to have this work finished fairly and adequately. Maintaining the status quo is just not acceptable. Every pupil sits the same examinations and all pupils have the right to adequate levels of funding and support so that their dreams and aspirations can be fulfilled. All schools are judged by the same Ofsted criteria, regardless of funding arrangements. It is also vital to our country’s future wellbeing and prosperity that every child is given a proper opportunity to succeed. Schools and academies in West Sussex have been severely financially disadvantaged for at least a decade. Over the past three years additional rising costs have seen matters reach a critical point. On average, large secondary schools have been making savings of approximately £250k year on year. Primary and special school budgets have been under equal pressure. What does the National Funding Formula do for low funded schools and counties? “In conclusion, the new national funding formulae will redress historic inequities in funding that have existed for too long” – Justine Greening MP – Secretary of State for Education – New National Funding Formula announcement, September 2017. “This means that for the first time everyone can see what the national funding formula will mean for them and understand why. Alongside addressing these historical injustices…” – Nick Gibb MP – Minister for Schools, October 2017. The new National Funding Formula does not solve the two problems that it was designed to tackle – real terms funding decline and funding inequalities across schools and counties. The new National Funding Formula has injected some additional cash in to schools. Much of this will be offset by rising costs. In real terms school budgets will either have a small uplift or will remain static in 2018 and beyond. Worked examples for individual schools are provided below to demonstrate this point. Schools and pupils are judged by identical performance data including KS2 and GCSE outcomes and also by OFSTED. Funding for schools with similar socio-economic characteristics will still be hamstrung by significant inequities under new National Funding Formula proposals. Please note these statistics are all based on the Department for Education’s own database for the financial year 2018-19. The figures relate to year groups 7-11 and do not include additional funding such as Pupil Premium Grant (PPG). PPG is worth £1320 per eligible pupil in primary schools and £935 per eligible pupil in secondary schools. NB a secondary school with 250 pupils eligible for free school meals in the last 6 years would receive an additional £233,750 through PPG. A large secondary school with 25% of pupils (400) eligible for Pupil Premium would receive an additional £374,000 each year. It should be noted that London schools must pay a higher London weighted salary. This can account for 10-15% higher costs. Areas as such as Crawley, must also pay a higher ‘fringe allowance’ for salaries. How does the new funding formula impact upon schools and academies in West Sussex? Under the new National Funding Formula, West Sussex will receive £12.8 million. West Sussex has 104,000 pupils so our per pupil uplift is £12.8million divided by 104,000 = £123 per pupil. In 2018 West Sussex pupils will receive £423 million in total. The average funded authority – Reading – will receive £30 million more. Over a five year span – the lifetime of secondary school placement – pupils in Greenwich will receive £725 million more than their counterparts in West Sussex. Over a five year span – the lifetime of secondary school placement – pupils in Hackney will receive £1.31 billion more than their counterparts in West Sussex. All of the funding differences noted above exclude the additional funding that Pupil Premium provides. Please note that the same proportionate funding differentials apply in the primary school sector. Manor Green Special School (Crawley) receives £4,120 per pupil less than the national median excluding London. This equates to -£861,080 (23% less funding) for their roll of 209 severely disabled students. They lack the average London median income by £12,598 per pupil for 209 pupils, this creates an income difference of -£2,632,982 (71% less funding). The calculations above show the funding that exemplar secondary schools in West Sussex will receive in 2018/19 and compares it to the funding that the same sized average funded school would receive in Greenwich (£6,451 per pupil) and Hackney (£7,840 per pupil). Please note that for simplicity the calculations are based on the Secondary Units of Funding (SUF) which apply to Greenwich and Hackney. The SUF is the average unit of funding based on all NFF formula factors and local pupil characteristics for secondary schools in each LA. Premises costs, such as rates and PFI are excluded from all calculations.